Aga Baranska , born in Poland - lives and works in Gdynia and London. Aga Baranska is inspired by her gipsy roots and her passion for travel. In her work she travels between cultures and religions and create artworks that reflect that; it can be just the colors from India or paper-mache masks from Mexico. Aga's work range from paintings and textiles to sculptures and collages always with strong fashion undertone. In her portraits and figures she uniquely captured emotional states creating a gallery fills with dreams, melancholy and passions. Her paintings are full of vibrancy and colour but also maintain a contemporary-chic edge with their mixture of mediums and lively design. Over the years her personal style has become recognisable as eclectic and very feminine. 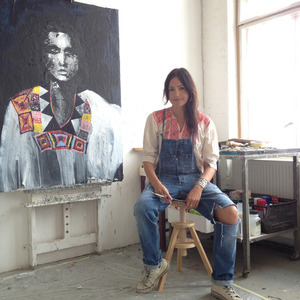 Aga graduated with distinction from both :Visual Art in Poznan and London College of Fashion. Her work has been exhibited in Tokyo, London, Berlin and Gdynia. Her work has been published by: The Times, Saatchi&Saatchi, Elle, Glamour, Marie Claire, Spur Japan, The Face, Zoom on Fashion Trends, The Big Book of Fashion Illustrations, The Art of Fashion Illustrations and Contrast.